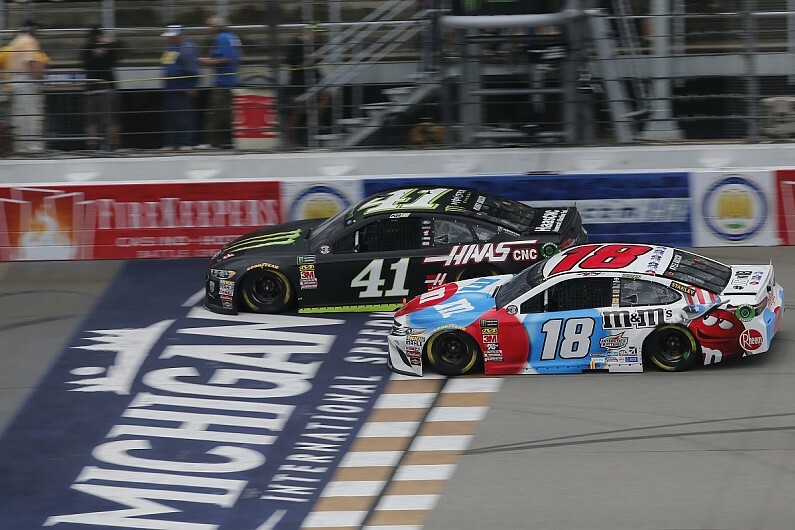 Toyota driver Kyle Busch brought a ‘knife to a gun fight’ against Ford and it did not matter “how sharp the knife” was in the Michigan NASCAR Cup Series race. Joe Gibbs Racing’s Busch was fourth last Sunday behind a Stewart-Haas Racing and Ford 1-2-3 comprising Clint Bowyer, Kevin Harvick and Kurt Busch. Busch had worked his way to fourth from the back of the field after he had failed a pre-race inspection because of a splitter issue. He narrowly missed out on third to his brother in a late duel, in a race in which engine performance was crucial and gave Ford an edge. “The blue ovals [Ford] were just tough, it wasn’t anything about SHR,” Busch said. “They go down the straight really, really fast. “We have a hard time keeping up with them there, but our car through the corner was really awesome. “I thought we had something for them and if it was going to be a little bit hotter and sunnier, I felt like we were going to be really good. “That just wasn’t the conditions, it was so chilly and cool and with lots of grip, and that was better for all those [Ford and SHR] guys, but we gave it a hard-fought fight and came home with what we could there – a fourth. “I thought we had third and then Kurt blew my doors off on the straight and we’ve just got to get better there and try to make it up and be able to put on a fight here later on this year. Ford’s global performance director Mark Rushbrook agreed Ford’s dominance at Michigan owed much to its engine. “To be successful with this track, you’ve got to have strong engines,” he said. “With the RPM range that they’re running, high RPMs, having the power [is] up there, but also [being] able to get out of the corners with the speed differential in the corners, and aerodynamics.